73% of in-house marketers and 76% of US agencies said SEO provided excellent or good return on investment (ROI). 89% of worldwide marketers rated SEO successful at achieving objectives of improved search rankings, website traffic, and lead generation. But good, modern SEO also takes time. 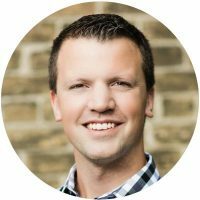 Today, SEO is about building a reputation with users and search engines, and that can’t generally be done overnight. The spammy tricks that used to produce fast, dramatic results don’t work anymore. Users want quality, and Google means to deliver it. The C-suite, however, wants results. Yesterday. What’s a marketer to do? While most promises of a “quick win” for SEO should arouse suspicion, there are a few considerations that might currently be hindering your SEO. Cleaning up some foundational technical concerns, and updating your general strategy, can set your SEO free and result in some quick gains that will impress the boss. SEO work can be categorized into two types: technical and engagement. Technical SEO is what most people think of when they hear, “SEO.” Focusing on technical SEO does not drive meaningful, long-term gains, but there are some technical considerations that can hold back even the best SEO if they are not set up right. Fixing them can result in some very simple, quick SEO wins. As search engines crack down on spam, keywords have gotten a bad rap, but as long as people use words to communicate with search engines, keywords will have an important place in SEO. Hopefully, you are planning content around keywords, so there’s no question about which keywords are appropriate for a piece of content. All that remains is to use those keywords well—whether they appear in search results, in the content, or behind the scenes. In search results—The title and meta description that represent a landing page in search results is a search snippet. You should be able to dictate what appears in these fields, so include the keyword naturally in the SEO page title, URL, and meta description. If your site runs on WordPress, a great tool for this is the Yoast SEO plugin. In the content—Use the keyword in the first paragraph of content and in sub-headers consciously but naturally. There is not a perfect ratio when it comes to keyword use, so be mindful of using keywords as appropriate, but don’t squeeze them in, making the text sound awkward. Behind the scenes—Images and media give you one more chance to optimize keywords on a page, as long as every field isn’t stuffed with the keyword and variations of it. Use the keyword naturally in media file names, alt text, captions, and/or title tags. Without appropriate keyword usage, Google may not be able to rank a page accurately for relevant search terms. This can mean the wrong people are getting to your site (which gives you a high bounce rate), or that you’re not getting much organic traffic at all. These are all things to keep in mind for future content, but can also be applied retroactively. Review your most important landing pages and make sure keywords are used well. Updating those pages may improve rankings after a short waiting period. Duplicate title tags, meta robots, etc. If your eyes start to glaze over reading that list, don’t worry. You can spring for some basic HTML and/or CSS training, or work with someone in web development to help sort these things out. Better yet, outsource it. Find an experienced SEO firm that can conduct a technical SEO audit for you. Once the code is clean, Google will index the site correctly and stop penalizing the site errors. A sitemap is an XML file that lists and organizes the URLs for a site. The sitemap allows Google to find each URL easily, along with information on when the URLs were last updated and the type of content on the URL. Most content creation platforms allow a marketer to automatically create an XML sitemap, so programming is not necessary. There are also easy-to-use XML sitemap generator platforms, such as XML-Sitemaps.com, that automatically create sitemaps for you. Select your site on your Google Search Console homepage. Links are included naturally in the text. A link should be a way to give readers more information on a certain topic, not take them to a website that has nothing to do with the text. Links lead to quality websites. Make sure the link does not go to a page that does not exist or a low quality/spammy website. Links build a digital reputation, so only link to reputable and authoritative websites. Include internal and external links. It’s important to link to blog posts and pages on your website, and to other reputable websites. Try to use a balanced ratio of both internal and external links. If you are making any of those mistakes, Google may not trust your website (aka if you have too many links, it looks spammy), so go through each page and re-visit the link strategy. Penguin 4.0 makes a clean backlink profile an urgent priority, but it also means that fixing issues can produce relatively quick wins. That digital reputation goes two ways, and getting links from low-quality sites can also hurt your website’s authority. You can use a tool like Ahrefs or Monitor Backlinks to check out the URLs pointing to your site. If you see anything that might be hurting your authority, get the link removed. Sometimes that’s as easy as contacting the site admin and asking nicely. Sometimes you need to contact Google and disavow the link. In other words, you can ask Google not to take certain links into account when evaluating your site. Engagement SEO is a longer-term strategy that uses helpful, engaging content to rank higher on Google. Disclaimer: Good, long-term SEO is not quick, but these strategies can be applied for quicker wins. Why are people searching on Google? Because they want answers. An important part of a marketing strategy is answering these questions, but sometimes the real questions aren’t what gets typed into a search box, which is when user intent comes into play. User intent is the question behind the query. For example, if your company has a customer relationship management (CRM) software, most likely one of your keywords is “CRM management.” But when people type “CRM management” into Google, what are they really looking for? A tool? A definition? The easiest way to find out is to simply type the keyword in Google. 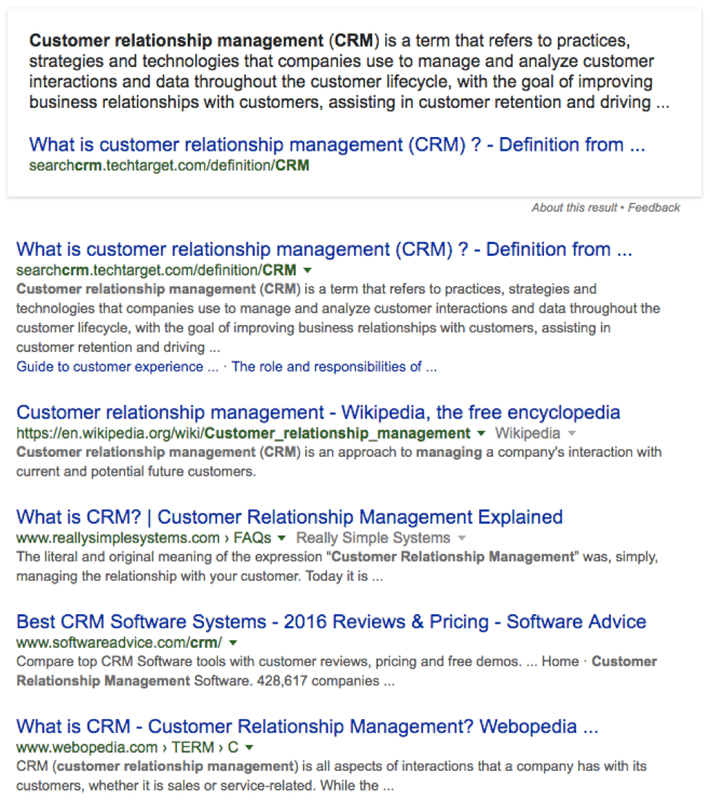 For “CRM management,” Google returns almost an entire page of definitions. This means that most people that type “CRM management” into Google want to find out what the keyword means. What does that mean for your CRM software website? You need to have a killer page that defines “CRM management” that can help people learn about the topic. How to make it a quick win: First, check the keywords for your existing content. Make sure the content that is on your site is answering the questions that your audience is actually asking when they search those keywords. Then, ask yourself how helpful that content actually is. Are there actionable take-aways? Does it link to further resources and tools? Make sure your core content doesn’t leave the reader with lingering questions or needs. How to make it a quick win: Look at some of the pages that host your best content and try changing the headlines, updating the CTA, or adding a video to make it more engaging and interactive. Make sure to A/B test as you go, so you know for sure what is working. Good SEO is a long-term strategy, but there are a few quick, technical fixes that must be done for Google to accurately rank your website first. A strong SEO campaign uses a healthy dose of both technical and engagement tactics in order to improve rankings and drive results.